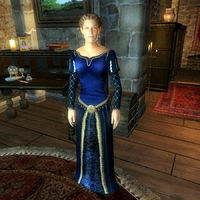 Adrienne has a greeting that can never be heard due to her Mages Guild dialogue taking precedence, she would have briefly introduced herself to you by saying "I'm in charge here. Adrienne Berene. Do you have Mages Guild business?"